이 약은 우리 나라의 전통의학발전에 특출하게 기여한 동방의학이 낳은 명의사 허준선생이 쓴 《동의보감》 잡병편(2)에 수록된 《우황청심원》원방에 따라 연구제조한것입니다. 우황청심원은 예로부터 우리 나라를 비롯하여 린방 여러 나라의 왕궁들에서 수백년간 애용해온 명약입니다. 우황청심원은 진경, 진정, 해열, 해독, 청열, 강심, 리뇨, 혈압내림약으로 특히 졸증성뇌질병(뇌혈전, 뇌출혈, 뇌허혈발작, 어린이경풍증 등)과 불안, 머리아픔, 목곧아지기, 메스꺼움, 뇌타박, 머리무거움 등의 치료와 예방에 특효가 있습니다. Uhwangchongsimwon is a traditional drug prepared according to the original recipe of “Uhwangchongsimwon” recorded in the chapter of miscellaneous diseases (2) of “Tonguibogam”, an encyclopedia of traditional Korean medicine, written by Ho Jun, a noted doctor in our country who made a great contribution to the development of Korea’s traditional medicine. 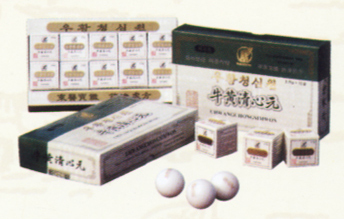 This medicine is a famous drug, which was widely used in royal palaces of many countries including Korea and its neighbours from several hundred years ago. The medicine acts as anti-spasmodic, sedative, antipyretic, antidote, haematic, cardiotonic, diuretic and hypotensive drug. It has a special virtue for prevention and treatment of various cerebral apoplexies including cerebral thrombosis, cerebral haemorrhage, ischemic cerebral spasm, uneasiness, headache, stiff neck, nausea, cerebral contusion and depressed feeling in the head.